Anti-Aging Elixir is a superb anti-oxidant. No carrier oils are utilized in this formula, and this great anti-aging product is formulated from a proprietary blend of superb therapeutic grade, anti-oxidant herbal essential oils. Anti-Aging Elixir is inexpensive and it has an ORAC value of well over 2,000,000! Anti-Aging Elixir is a superb anti-oxidant. No carrier oils are utilized in this formula, and this great anti-aging product is formulated from a proprietary blend of superb therapeutic grade, anti-oxidant herbal essential oils. Anti-Aging Elixir is inexpensive and it has an ORAC value of well over 2,000,000! ORAC (Oxygen Radical Absorbance Capacity) is a standardized measurement developed by the U.S. Department of Agriculture based on both the time an anti-oxidant takes to react and also on its anti-oxidant capacity in a given sample. In comparison with Anti-Aging Elixir's ORAC value of over 2,000,000, Vitamin-C has an ORAC value of only 189,000 and Vitamin-E has a value of 135,000. The recommended daily anti-oxidant dose for humans should add up to approximately 5,000 ORAC units each day. In a study of 36 older people, boosting fruit and vegetable intake to reach 3,200 ORAC units a day increased the anti-oxidant potential of the blood by 10 to 15%; enough to have an impact on disease prevention. While you would have to consume 208 grams of blueberries or 746 grams of cherries (or almost two and a half kilograms of bananas) to reach the recommended 5,000 ORAC unit daily value, only one quarter gram of Anti-Aging Elixir provides the same anti-oxidant protection. Again, Anti-Aging Elixir is blended from the most potent anti-oxidants available, and the fact that they are natural herbal essential oils is an added bonus. The therapeutic grade essential oils utilized in this blend are: certified organic sweet orange (citrus sinensis), certified organic clove bud (eugenia aromatica), coriander seed (coriandrum sativum), certified organic sweet marjoram (marjorana hortensis), clary sage (salvia sclarea), and certified organic nutmeg (myristica fragrans). 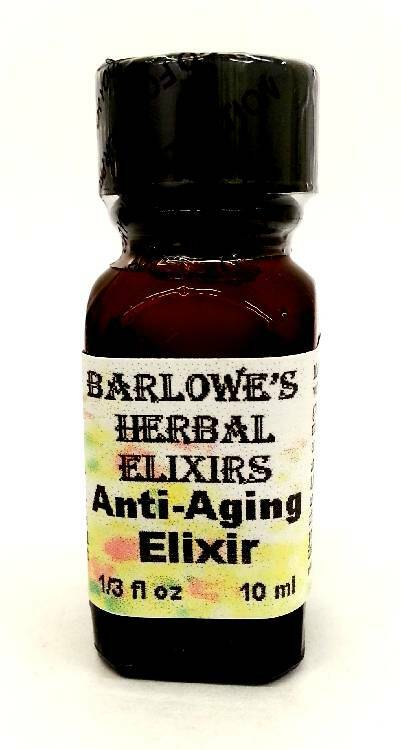 Caution: Although Anti-Aging Elixir is formulated from only the very finest, natural, herbal essential oils, they are very concentrated and quite potent, and should be utilized with care. This product is for dietary or aromatic use. Do not get in your eyes! If used on the skin, dilute accordingly, as it may cause irritation in some individuals. Anti-Aging Elixir should not be used if you are pregnant, nursing, or prone to seizures! If side-effects occur, discontinue use immediately! The above statements have not been evaluated by the Food and Drug Administration (FDA). This product is not intended to diagnose, treat, cure, or prevent any disease. Directions For Use: Shake well before using as some of the oils will separate over time. Take 2 to 4 drops under the tongue or orally two or three times a day, either by itself, or mixed into a couple of ounces of milk or water. You will find its superb anti-oxidant action well worth its spicy flavor. Anti-Aging Elixir may also be used in aromatherapy.